Flash Friday is here again and today is going to be a giant sized edition. Not that the review itself is going to be double sized or anything, I’m talking more about the size of the item I’m reviewing. Last week I said I was waiting for UPS to deliver a package and happily it did come on time. 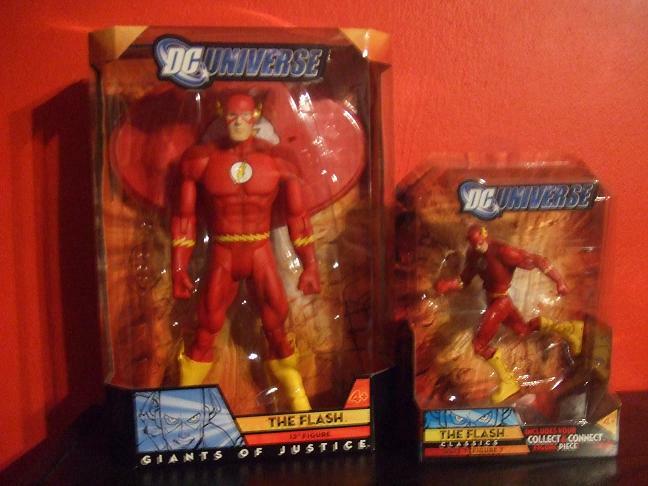 From SDCC 09 we have the 12 inch Flash, Giants of Justice figure. So it is over sized, but is it any good? Check out after the jump. I didn’t jump at picking this figure up when it first came out; I had the DC Universe Flash already. This is just a larger version of that mold for 40 bucks. Then I was randomly surfing the net the other weekend and I found that Toys R Us are currently selling it for 20 (I have no idea how long this will last). You may want to check your brick and mortar stores to save yourself some shipping and handling charges. 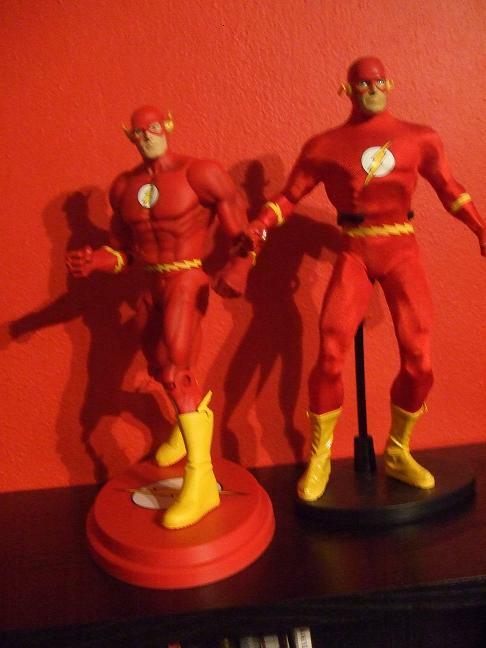 I knew the figure was going to be 12 inches tall but it feels much bigger then I expected. The pictures don’t do it justice. He just feels huge. Besides that he has a satisfying weight to him also. Sometimes when you get oversized figures parts can be hollow. It doesn’t feel like it here. For an accessory he comes with a base. 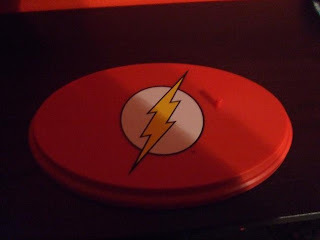 I like it though; it has a nice Flash symbol painted on it. 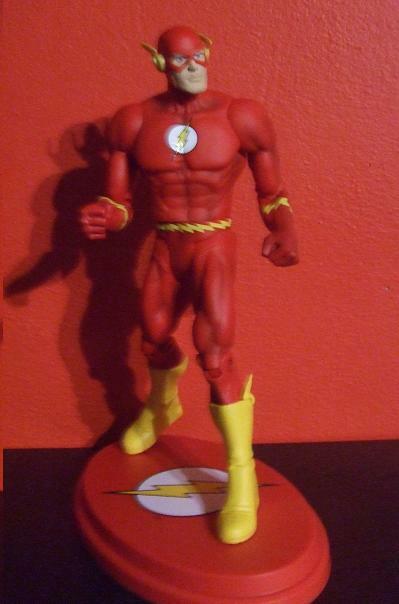 He is sculpted with both hands clenched into fists anyway, so it isn’t like he can hold anything. Articulation is the same as the smaller version. You get the neck, shoulders, elbows, waist, crotch, and knees. It would have been nice to see a little more, but realistically they weren’t going to retool the mold just for a convention exclusive. 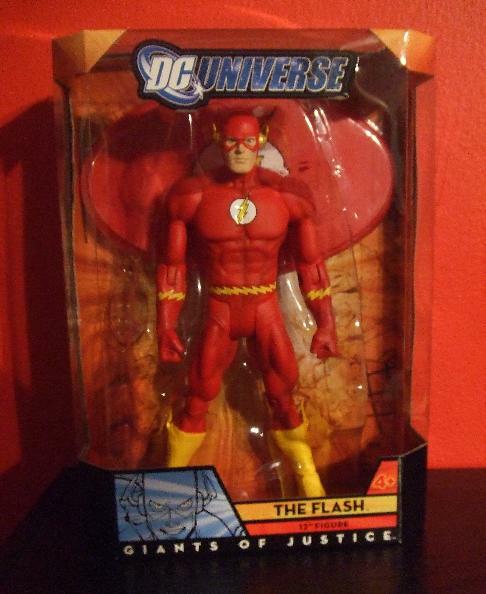 In package his build looks a little off, almost hunchbacked. Once you take him out of the package though and adjust the pose it looks much better. Overall I’m very happy with the figures. I’m also very happy with the purchase, especially since I waited till it was half price. Also, I apologize for some of the pictures this week. I didn’t notice how badly they sucked till I loaded them up. Next week’s will be better, I promise.